In what can be termed as a major breakthrough for the Centre in the ongoing Kashmir unrest, the National Investigation Agency (NIA) on 19 May, registered a preliminary enquiry into the funding of Hurriyat leaders Syed Ali Shah Geelani, Naeem Khan and others in Jammu and Kashmir by Lashkar-e-Taiba (LeT) chief Hafiz Saeed and other Pakistan based terrorists. According to sources, a team of NIA led by senior member has reached the Valley for inquiry into Hurriyat funding. The team will probe into the nuances of the funding which are mostly being made for subversive activities including stone pelting and damage of public properties there. While Hurriyat leaders and separatists have been telling Kashmiris to not send their children to army-run schools, alleging that these institutions were weaning the next generation away from their religion and culture, the family members and children of many of these have got the best education, settled abroad and eventually led a luxurious life. 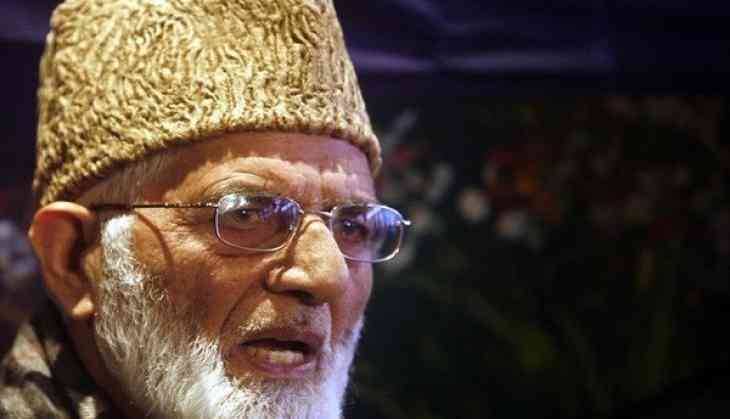 An apparent example of how the kith and kin of these Hurriyat leaders availed the above-mentioned is the faction of Syed Ali Shah Geelani, which inversely always has goaded the youth of Kashmir to come out on the roads and leave their studies for a 'bigger cause', indirectly urging them for 'stone-pelting'. Nayeem Geelani, son of Geelani, who, a few days back, had blamed the army-run schools for indoctrination, is a medical practitioner in Rawalpandi, Pakistan. His other son, Zahoor, is crew member of a private airlines in India. Geelani's daughter is a teacher in Jeddah and her husband is an engineer there. The Bharatiya Janata Party (BJP) on May 7 said that time has come for everyone to realise that Pakistan is the core reason behind the rampant terrorist activities in the Valley. "Now they must address the truth and the truth of Jammu and Kashmir is something else. If solution has to be found out then it has to come to this process of discovering the truth and trying readdress the situation," BJP leader Sudesh Verma told ANI. Verma said that Pakistan's only motive is to create trouble in the Valley and everybody is aware of that. "Now it's time for everyone to realise this, including those pseudo-liberals, who see no fault with Pakistan and go on blaming the Indian Security forces," he said. According to reports, post the recent arrest of two ISI operatives in India, it has come to light that separatists in Jammu and Kashmir area have been getting a constant flow of funds - to the tune of Rs 70 lakh - from the Pakistan ISI over the past few months. Slew of documents that have been accessed cite that the nexus between Pakistan and the separatist leaders is responsible for instigating the youth to conduct violent acts in the conflict-ridden state of Jammu and Kashmir. Earlier on April 28, reacting on the Supreme Court orders, wherein it asked the Jammu and Kashmir High Court Bar Association (JKHCBA) to take to various stakeholders and consider their opinion in connection with the plea against the use of pellet guns in the state, the Centre categorically said that it would not talk to people who were separatist leaders and those who talk of 'Azaadi' and freedom. Attorney General Mukul Rohatgi, top law officer representing the Centre, made this statement to the apex court. The court asked the association leaders to get names of the people, who can hold talks with the Centre for the resolution of the present situation in the state. JKHCBA was also asked to assure the top court that no stone pelting would be committed in the future if they wanted prohition against the use of pellet guns. The apex court had earlier asked the Centre to consider effective means other than use of pellet guns to quell stone pelting mobs in Jammu and Kashmir as it concerns life and death.